If you're like me, then you're rarely just watching TV. 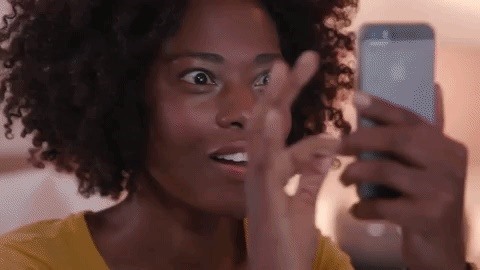 You're probably also simultaneously following reactions on Twitter during a live airing of The Walking Dead. Or perhaps you're checking your fantasy football scores while a real game is in progress. Or you might just have the TV on in the background while you're writing an article about a new augmented reality app. 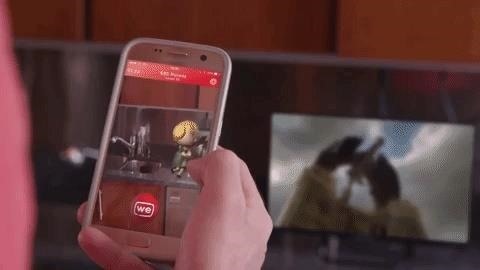 The new app I'm writing about today (while Captain America: The Winter Soldier plays in the background), is called We Are TV, and it wants to take advantage of your urge to multitask while watching TV. We, the multitaskers of the world, are not alone. Over the summer, Facebook published the results of an in-home eye-tracking study conducted in the US. The study found that participants focused their attention on the TV screen 53% of the time. One of the top distractions was smartphones, which 94% of participants kept with them while watching TV. "A lot of this usage is not connected to the show," says Martin Rogard, founder of We Are TV and former executive at DailyMotion. "And we thought with augmented reality, there was a big opportunity to be able to create a product to make watchers more engaged with the show." Available for iOS and Android, We Are TV turns your TV time into a game. Select a live or streaming program, and the app spawns a variety of cartoonish characters around the TV. Players collect them by throwing red and white balls at them. Yup, this is Pokémon GO' for your couch. "For the most popular TV shows — and a lot of them right now are in France, and we are expanding in the US — you're going to get specific 3D characters which are related to the show," says Rogard. Several popular shows in the US are already represented with customized characters. One of those shows is Orange Is the New Black, where the characters bounce around in orange jumpsuits. If you select The Walking Dead, you can catch a grizzled character named Daryl, just one letter off from his counterpart in the show. During Game of Thrones, a lady with her hair in buns name Ayla appears. The other aspect of the app leverages the social experience of watching TV. In between games, players can toss virtual hearts, tomatoes, and bombs at their screens based on their reaction to things like dramatic plot twists and sports scores and plays. Since the app authenticates users via Facebook, any of your friends registered with the app will see your reactions as well. To date, no app that has emulated Pokémon GO's style of gameplay has been able to replicate the same level of viral success. Nevertheless, We Are TV has made an impressive debut in France, where the app launched about a month ago. The app shot to the number one ranking in the entertainment category in France's iOS App Store, surpassing Netflix. So far, the app is averaging between 5,000 and 6,000 daily users, with more than 500,000 reactions to date. Some other interesting numbers have emerged from the data the app has collected so far. For instance, the app's audience skews heavily towards women, representing upwards of 75% of players. And while player demographics skew toward younger users, the overall user base of the app is fairly broad. "We found that the age range skewing to the younger audience, but as people [just] watching TV, it's more classic 15 to 35 [year-old] audiences, not just the very young people," says Rogard. "A lot of people, when we said we were doing a game where you catch characters, they said 'OK, you are going to have [an audience of] 10-year-olds or 20-year-olds.' I think it's the same for Pokémon GO, actually. A lot of people in their 30s or 40s want to play games because they're in front of the TV, or they want to pass time." In terms of monetization, We Are TV will add in-app purchases within the next two weeks. Further down the line, the app will also offer other special items for purchase. Considering the app's close ties to TV, additional partnerships are possible as well. "It makes sense to envision another review model, which would be able to integrate with brands or partner with some TV shows, if they want to do something special on that TV show," says Rogard. "We definitely want to be able to help classic broadcasters or TV production companies get into the AR game." 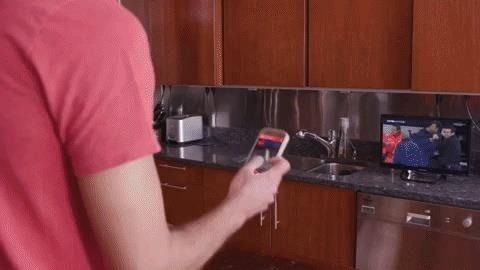 While several TV properties have experimented with AR technology, We Are TV would give them a platform that networks could turn to whenever they wanted to promote a specific show instead of creating separate second-screen apps.